In a picket-protest of terminated workers of Jollibee Foods Corporation (JFC) main commissary and warehouse in Parañaque City today, the Samahan ng Manggagawa sa JFC (SM-JFC) and Defend Job Philippines said that the JFC was circumventing the Compliance Order on their regularization issued by the Department of Labor and Employment (DOLE). “With the continuing refusal and disregard of JFC to the DOLE and its order, the fastfood giant management is clearly showing that it is not really serious in providing regular employment to its almost 29,000 contractual workforce,” Rogelio Magistrado of SM-JFC said. The labor groups said that hundreds of workers have been terminated after the JFC ended its contracts this week with Toplis Solution and Staff Search Asia Cooperative, two of its agencies in the main commissary and warehouse in Parañaque City. The commissary was responsible for storing, handling and distributing products and other logistical needs of all other warehouses and Jollibee stores in the whole of Luzon. It also provided logistics services to Jollibee, Chowking, Greenwich, Burger King, Mang Inasal and Red Ribbon. 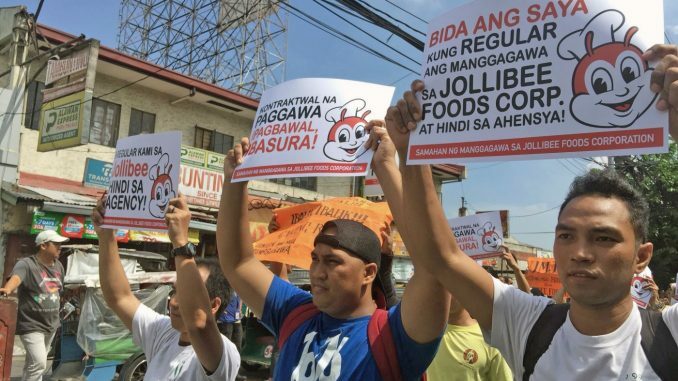 Jollibee workers protested at the fastfood chain’s commissary and warehouse following the termination of agency contracts that would lead to the termination of workers. Photo by Kathy Yamzon. SM-JFC and Defend Job Philippines said that the cessation of agency contracts caused termination of hundreds of workers despite having an existing DOLE order and findings that the JFC tops Philippine corporations involved in labor-only contracting scheme. Maigstrado agreed with the International Trade Union Confederation (ITUC) index that said the Philippines is one of the worst country to work in. According to Magistrado, their concrete issues of contractualization, illegal termination and unfair labor practices were clear proofs of the real issue of employment in the Philippines. 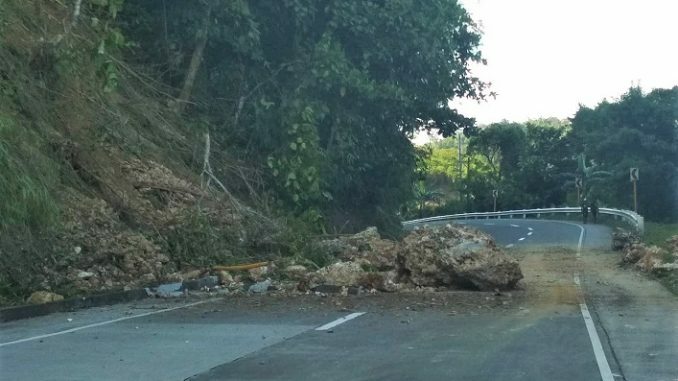 In a statement posted April 4, DOLE National Capital Region Director Henry John Jalbuena said his office ordered JFC to regularize 6,482 workers deployed by its 2 contractors. 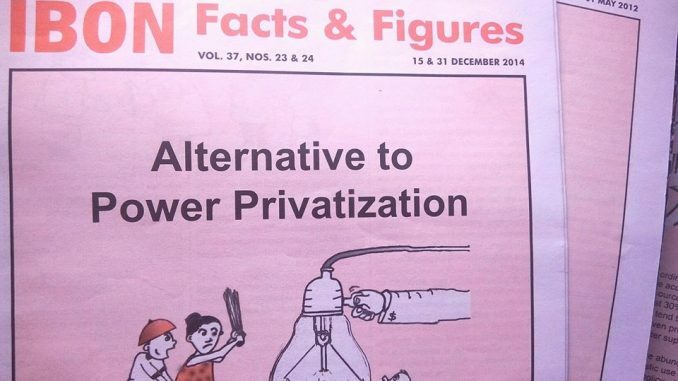 This was stated in a report to DOLE Undersecretary Joel Maglungsod. JFC was also directed to refund illegally collected payments to 426 affected workers in the amount of P15,432,305.00 for Coop Share, Coop Christmas Party Paluwagan Fund, and Coop Savings Fund. DOLE also ordered 5 of Jollibee’s contractors to return unlawful wage deductions, bonds, donations, shares and other illegal payment collections to 412 affected workers with a total amount of P4,137,158.15. In a statement on April 4, JFC said they received the order and would follow the process to appeal it. “JFC remains committed to complying with the law and DO 174, which allows contracting arrangements with legitimate service providers. In compliance with regulations, we only deal with reputable service contractors that have been duly accredited and registered with DOLE. We have been cooperating and will continue to cooperate with DOLE,” JFC said. Of JFC’s many contractors, 2,737 crew members of Staff Search Asia Cooperative and 3,745 crew members Generation One Resource Service and Multi-Purpose Cooperative should be regularized according to DOLE. The post Jollibee circumventing DOLE order to regularize workers – workers’ groups appeared first on Manila Today.